Professional planners from Chester County are invited to attend the spring 2018 Chester County Planners’ Forum from 8 a.m.-10 a.m. April 17 at the Oakbourne Mansion, a beautiful historic property in Westtown (1014 S. Concord Road, West Chester, Pa., 19382). Understanding Transportation Impact Fees, presented by Joe Platt, P.E. of Traffic Planning and Design, Inc.
To register for the forum, visit: https://2018-spring-planners-forum.eventbrite.com. Email any questions you may have to ccplanning@chesco.org. The Pennsylvania Chapter of APA will be hosting a full-day, in-person AICP exam prep session this spring. The session is free for PA Chapter members (non-PA Chapter members pay $35) and open to anyone interested in taking the exam. The session will review the content outline of the AICP exam, which APA recently updated, and provide details on the different content areas. The exam has been updated to reflect the new content outline, and the session will take time to clarify understanding of the revised exam. Questions are encouraged throughout the day. Breaking Ground 2018: Transforming a Region Together is a day-long conference that aims highlights the principles and goals of Connections 2045 Long-Range Plan for Greater Philadelphia [https://www.dvrpc.org/Connections2045/]. While our region is made up of 352 local governments, we will be better-positioned and more economically competitive if we move forward together, as a region. This year’s conference celebrates regional cooperation and government efficiency. The keynote speaker—Brian Elms—is an expert in management and government performance. All attendees will receive a copy of Brian Elms’ book, PeakPerformance: How Denver’s Peak Academy is saving millions of dollars, boosting morale, and just maybe changing the world. Concurrent sessions will feature government transparency, sustainable environmental practices, collaboration between businesses and government, the use of data and metrics, and a celebration of diversity age-friendly communities. Breaking Ground 2018 is expanding to include a Learning Lounge, which will feature businesses and tech companies that assist municipal governments in better serving their citizens. Want to represent your community and engage in the regional planning and decision-making process? 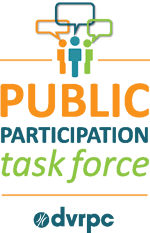 Apply to be a member of DVRPC’s Public Participation Task Force (PPTF) today! The mission of DVRPC’s PPTF is to provide access to the planning process, to make a platform to discuss timely issues, to serve as a conduit for DVRPC information to organizations and communities across the region, to assist the Commission in implementing public outreach strategies, and to empower citizens to be a part of the planning process. For more details about the PPTF, visit http://www.dvrpc.org/Committees/PPTF/. Applications will be open through January 8th, 2018. The application is online here: http://www.dvrpc.org/GetInvolved/PPTFApplication/. If you have any questions, please contact Shoshana Akins, Public Participation Planner, at 215-238-2817 or sakins@dvrpc.org. Curious but want to know more? Interested citizens are invited to attend the PPTF meeting on the evening of December 14th starting with dinner at 5:30 PM. Come network with current members and learn more about how the PPTF works. To RSVP, please email public_affairs@dvrpc.org by December 12th. Increasingly, philanthropic organizations are thinking more broadly about how to support systemic change in local communities. On this call, you’ll hear how three foundations are investing in long-term transformation using Community Heart & Soul®, the Orton Family Foundation’s community development model. Community Heart & Soul is active in PA currently, with potential for future opportunities. Join us for APAPASE’s Annual Event, which includes an opportunity to meet and mingle with other Greater Philadelphia planners, hear an educational presentation (1 CM credit requested), and honor the winners of the John E. Pickett Student Scholarship competition. Ticket price includes two drink tickets and heavy hors d’oeuvres. The 2017 Atlantic Hurricane Season is on track to be one of the top ten most active seasons on record, with five major hurricanes, and a streak of eight straight hurricanes from August 9 to September 29. This begs the question: what is the role of planners and planning in reducing risk to flooding and increasing community resilience? How can flood risk reduction meet other community planning goals, like water quality improvement, neighborhood development, and community cohesion? Join us at the APAPASE Annual Event to explore these issues and more. 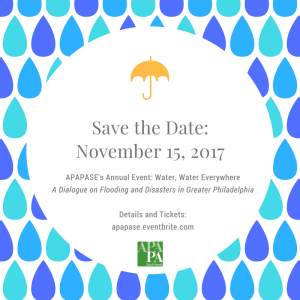 A panel of water and resilience planners will explore these issues and more with APA members from across the region. Make a commitment during #PlanningMonth to become a planner and register for the Information Session on November 2nd for the MS City and Regional Planning, Temple University. The program has two concentration tracks in Sustainable Community Planning and Transportation Planning. Both are areas of expertise that are in wide demand in the greater Philadelphia region as well as across the country and globe. Accredited by the Planning Accreditation Board since 2012. At the Meet and Greet with MS CTRP students and alumni, you’ll have a chance to learn about the various career paths alumni have taken from traditional government planning to community-based programming and policy development with nonprofit organizations, from government innovation to entrepreneurial startups, and more. October marks the opening of APA’s application period for the 2018 Ambassadors Program. This initiative has been created to reach future planners with diverse racial, ethnic, and cultural backgrounds. With recent national events, it is critical for the field of planning to grow more inclusive and diverse to continue to be relevant to communities of color and disadvantaged populations. It is also increasingly important for individual planners to connect to young people in these communities on a personal level to support just decisions and live up to the APA code of ethics. The Evolving Nature of Senior Living: what if everything you were told about aging was wrong? What if everything you were told about aging was wrong? Keynote speaker, Dr. Bill Thomas, is challenging how Americans think of aging, the models we have for senior housing, and how connectedness can overcome the loneliness that often plagues the lives of the elderly. Provider Magazine has called Dr. Thomas’ Green House Project the “pinnacle” of the culture change movement in senior housing and the Wall Street Journal has called him one of the nation’s “top ten innovators” changing the future of retirement.